Flora Annie Tanner was born to my parents, Allen Raymond and Sarah Grace Wakefield Tanner on June 11, 1921. 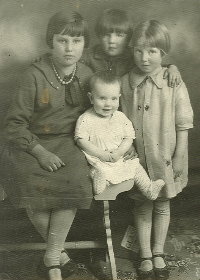 She was their second daughter, my sister Alta Grace having been born on August 30, 1918. My brother Wayne came along in 1925 and I was born in 1927. Nine years later our youngest brother, Harvey Milas, was born. Even as a very young child Flora became Mother’s best helper. Although Alta was older than Flora, because of her hearing deficiency and some behaviors associated with it, Flora was always with her and helping to take care of her. In their adult years, Flora was still looking out for Alta and was her best friend. When baby Wayne came along Flora looked after him and helped with changing his diapers and taking care of other of his needs. Mother relied upon Flora for a lot of help. After I was born, as soon as I got old enough to do things, I also helped mother, bringing in wood and hanging the wash and other chores to make it easier for her. We were taught to all help each other. Flora went through the 10th grade at the Grouse Creek School. 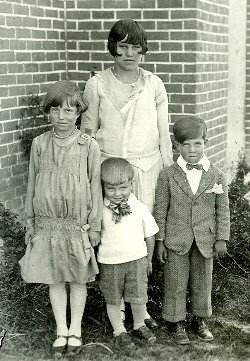 When she had to go into town to school she went to Ogden High and stayed with our Aunt Ev (Evelyn and Shorty Betteridge). In exchange for her board she was expected to help out around the house. At this same time, she worked with her Aunt Bertha and Uncle Henry Child cleaning at Child Elementary School. The school was named after Henry’s dad, and they worked at the school. The next year Flora went to Box Elder High School and stayed at the Harold B. Felt Funeral Home in Brigham City, Utah. She tended the Felts’ daughter in exchange for her board there. She graduated from Box Elder High School. Flora was always a hard worker and lived pretty much independently, taking care of herself. As soon as she was out of high school she moved into the Sun Ray Apartments and Alta came to live with her, and later Lewis came also. 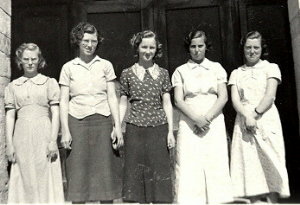 Some of the jobs Flora held in her early years after graduation included elevator operator at the Hotel Ben Lomond. The elevator would stop at a floor where Flora would be exposed to some sights she wasn’t accustomed to. Men would bring their girl friends to the hotel with them, and sometimes, after they had shared some alcohol and a room the young women would run naked out of their rooms with the boy friends chasing after them. She was also an elevator operator at the First Security Bank at 24th and Washington. She met the father of the movie actor, Robert Walker, while she worked there. She worked at Anderson Jewelry for a time and in the office of two chiropractors, Dr. Stromberg and Dr. Eckhardt. After Alta married Bill Clucas, Flora went to Grouse Creek for a while and then spent one summer in Palisade, NV working for the UP Railroad as a timekeeper and living with Lewis in the boxcar. Then she went up to Washington State and stayed with her Uncle Claude (and Zona) and worked there for a time. When she came back from there she hired on at the offices of the State Road Commission where she worked until she quit to go on her mission to California in 1962. When Dad died in April 1963 Flora came home for the funeral and then went back to finish her mission. She returned to her job at the State Road Commission and when Mother was forced to sell the Grouse Creek house to Frank Lee she and Flora moved to the house that Flora bought on Capitol Street. They were living there when she met Don Chambers and when Mother had her stroke. With Mother in the convalescent home, Flora was living alone. She went to the home to visit Mother at least once, and mostly twice, a day to fix her hair and be sure she was put to bed properly. She also began to fix the hair of several of the other ladies in the homes on Sunday so they would look nice for church. Flora married Don Chambers in 1970 in the Salt Lake Temple. 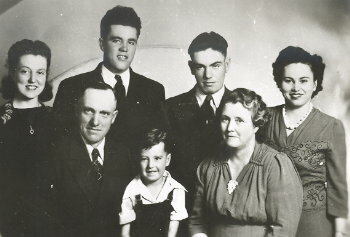 His two daughters, Rhonda and Norma were living with them and then his son, Jack, joined them also. Rhonda’s husband was in Vietnam and she was expecting a baby, so Flora was the one who went to be with her during the birth. Suddenly, she was a grandmother without ever having had a child. After Mother died in 1973, Flora and Don decided to go on a mission together. They were assigned to the Washington, D C. Temple for eighteen months. This mission was extended, and then they were sent to the Los Angeles Temple to serve another mission. Following this mission, they went on yet another mission to the St. George, Utah Temple. Eighteen months had turned into eighteen years. Age was catching up with Don, so they came back to Ogden and bought the condominium in South Ogden. Flora now spends a lot of her time as a volunteer at the McKay-Dee Hospital. Don’s health steadily grew worse and they moved into the Condo’s on 22nd Street. After Don’s death Flora lived there until her passing. Flora and I always got along pretty well together and tried to help each other. After we grew up and Flora would come back home to Grouse Creek for a visit she sometimes suffered extreme pain from bursitis in her left shoulder. She would be awake and crying in the middle of the night and I would get up and take her riding in the car all around Grouse Creek just to take her mind off the pain. When I had surgery years ago, she went with me to the hospital, and when she needed someone to drive her to the doctor, I would take her. She was a great help to Wayne while he was alive and was very protective and considerate toward Alta right up until Alta’s last day. I have a deal with Flora to clean my room and my bathroom for me and she has pocket money in her account that builds up for her to get things she wants on her own. Many Saturdays when she comes down here she wants to go visit Harvey and I ride along with her. Occasionally, we go on to Salt Lake and have lunch at Little America, her favorite eating place in Salt Lake, or we will go to Marie Callenders and have a bowl of soup. When we went to Branson, MO in 1998 we took Flora along and enjoyed seeing her have a good time which she well deserved since she is always trying to make things better for others. Flora was involved in an automobile accident and passed away from her injuries on 22 November 2005. She was buried in Lindquist Washington Heights Memorial Park.